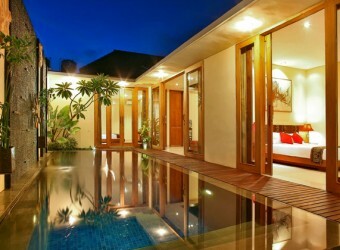 Bali Hotel It is located in Umalas of Seminyak area, Villa Ben. This is the modern style villa with private pool. Each villa has broad and luxury space to enjoy relaxing time, and elegant bathroom, modern furniture, etc. There are 3 bedroom in a villa that is suitable to use for group and family. The staffs are nice and friendly, convenient. I felt very comfortable. I think it`s also very convenient, there are many rental bikes, places for shopping and dining.